yesterday, i found my energetic hope being sucked thin by other people's words stemmed from emotions of anger and hatred that i read all over my computer screen. i tried to understand...and i couldn't. i see that some people are amazingly untouched by this victory, and i can easily let destructive attitudes stunt me. but i deeply want to move forward. and i know that it takes coming together and joining our efforts in our vision of a brighter tomorrow. 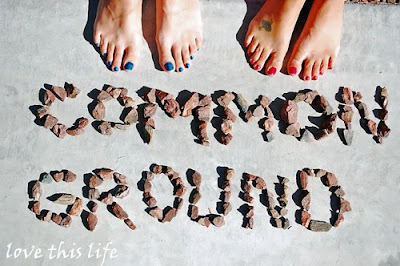 one thing i have found so incredibly inspiring is this notion of finding common ground. it is there, let us find it. check out this hope-full project . and then contribute your own power message. nope...we're not going that way.